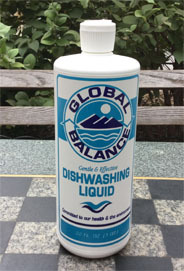 $7.05 Global Balance Dish Liquid is economical, effective, soft on your hands and kind to the environment. Just a few squirts are enough to clean your dishes. It contains only the mildest and purest plant-based cleaning agents, yet it cleans your dishes well. No dried out skin after daily use. You’ll be surprised at how soft your hands will be. It does not contain ethoxylated surfactants and cocamide DEA which are harmful to your health and synthetic colors or perfumes which can trigger allergic reactions. Lightly scented with oil of orange. 32 oz. Use everywhere liquid cleaner. Works on all surfaces without petroleum distillates, bleach, ammonia or phosphates. No synthetic colors or perfumes. Highly concentrated, no need to rinse after use. 32 oz.